Today's map comes from the Centers for Disease Control and Prevention. Inspired by some state-preference maps they saw on Facebook last year, the CDC published a peer-reviewed paper "to present a more nuanced view of mortality variation within the United States." 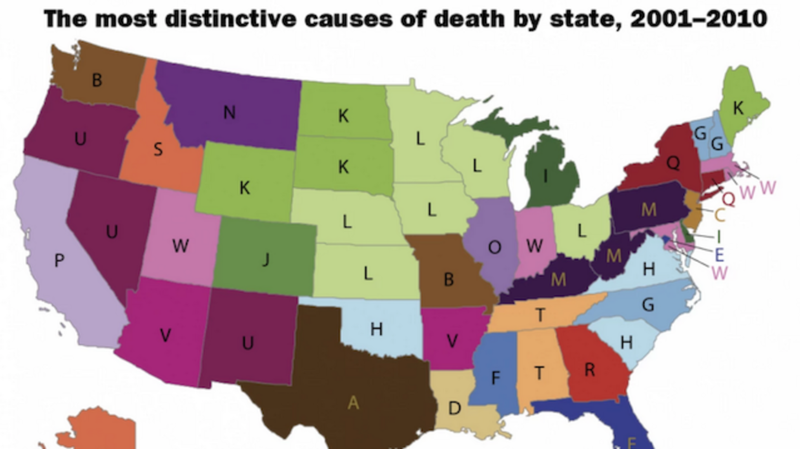 It's important to remember this isn't the most common cause of death in each state. As the Washington Post pointed out, that map would just be heart disease and cancer. The Afternoon Map is a semi-regular feature in which we post maps and infographics. In the afternoon. Semi-regularly. Thanks to Niraj Chokski of the Washington Post for sharing this one. The CDC requested this exact citation so here you go: Boscoe FP, Pradhan E. The Most Distinctive Causes of Death by State, 2001–2010. Prev Chronic Dis 2015;12:140395. DOI:http://dx.doi.org/10.5888/pcd12.140395.